It’s no secret – we LOVE WordPress. It allows us to develop websites that look great and function like a dream. One of the best parts is that it allows customers to keep their site updated, change things up and add functionality – all without having to pay us to do it. It really helps the site owner control and fully develop their site. Pretty sweet! While WordPress is easy and friendly to use, we still get quite a number of questions – so, we thought some resources, tips and tricks were in order. We’ll be putting up a new video every day, and adding a new section to our website that will bundle all our WordPress goodies into one area. So – what is the WordPress “Dashboard?” It’s really kind of like the dash in your car. It puts all your controls within reach and keeps them organize in easy-to-understand groups. There’s no radio, but – well, you can’t have it all. 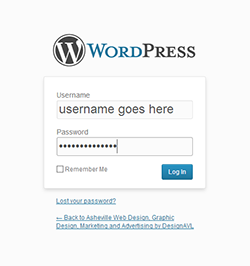 To get to your WordPress dashboard, you’ll need to log in to your site. If we’ve developed your web site for you, you’ll have received an email with a link and your username and password. Usually, it’s http://yoursite.com/wp-admin or http://yoursite.com/wp-login.php. You’ll drop in your username and password, and you’ll be whisked away to your dashboard. Dashboard: Click that to get back to the base level of your site. You’ll also see update notifications in there. Media: Manage your media files – photos, videos, documents, etc. Keep in mind that you can upload and manage media while in posts and pages, too. This option is really more for adding stuff that’s linked to in various parts of the site. For example, if you have a PDF that you want folks to be able to download, you would upload it using the “Media” segment – then you could just link to that file from other pages, in emails or other marketing materials. Newsletters, anyone? Pages: This is where you can add, update and change pages. Comments: Manage what other folks are saying on your site. Folks can say whatever they’d like – but you have the ability to approve or disapprove it. So, negative comments won’t appear unless you let them. You can also mark them as spam, because you WILL get spam comments. Just part of having a WordPress site. Don’t worry about them – nobody will see them, and they’re really not hurting much. Appearance: Manage your theme, your menu and your widgets. We’ll get more into those later. Plugins: This is where you’ll manage the plugins – things that add functionality to your site. Turn ’em on or off, delete them, add them, yippee! Users: You can add or edit users here. You can add administrators (who have full access to the whole site,) or other levels that have varying access to your site and your Dashboard. Give people power, take it away, reset passwords, etc. Tools: Not a lot going on here – but you can back up your pages and posts and what-not. Kind of cool. Settings: A lot of options here – permalinks, privacy, site titles, etc. There’s a lot of power in this part – but be careful, as this is one spot you don’t want to mess up. Stay tuned – much more coming. Be sure to subscribe to our blog (click on the sidebar thing – over there on the right) to get updates in your email. We don’t spam, you can unsubscribe whenever you’d like. But – you’ll be sure to get all our WordPress pointers, right in your box. Sweet!